Known locally as Praia do Homem Nú "Naked Man Beach", this sea beach is known for the practice of nudism and naturism. 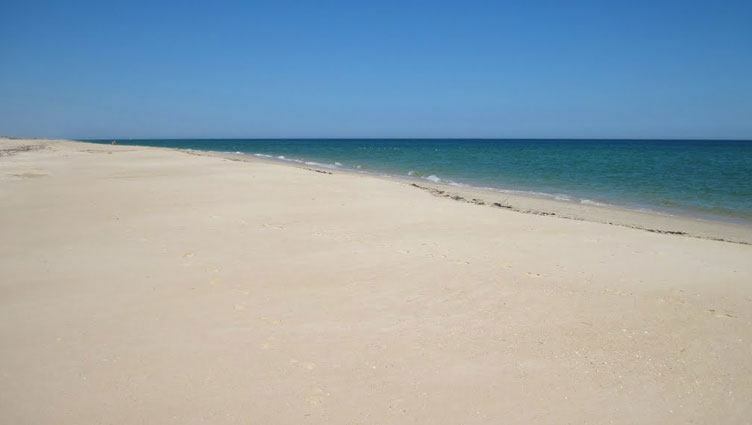 It occupies the western end of the Island of Tavira, between the official naturist area Barril beach and Fuzeta boat canal, a distance of more than 4 kilometres. Already in the mid-eighties this beach had high demand from naturist and nudist lovers, mainly British, German and Dutch. In the nineties, regular attendance was consolidated, and the beach began to appear also in national and international LGBT guides. However, during the last decade, the beach gradually lost its popularity to Cacela Velha Beach and even the Spanish neighbour Nueva Umbria in Lepe. One of the determining factors for this change of habits is the difficult access to the beach, which is made from Barril Beach, walking towards the west end of the island. Important Note: This beach has no support facilities or lifeguard supervision. Park in the tourist village Pedras d'El Rei; then cross the bridge over to the beach of Barril. Once you reach Barril, continue to the west along the beach. The area with LGBT often begins at the western end of the naturist beach (where the practice is legal), about 1500 metres from Barril beach.